When it comes time to renovate your home’s outdoor lighting, you may be overwhelmed after realizing how many lighting options are truly at your disposal. From sconces and recessed light fixtures to pendant and ambient lighting, there are a number of ways that you can transform your house into your dream home. 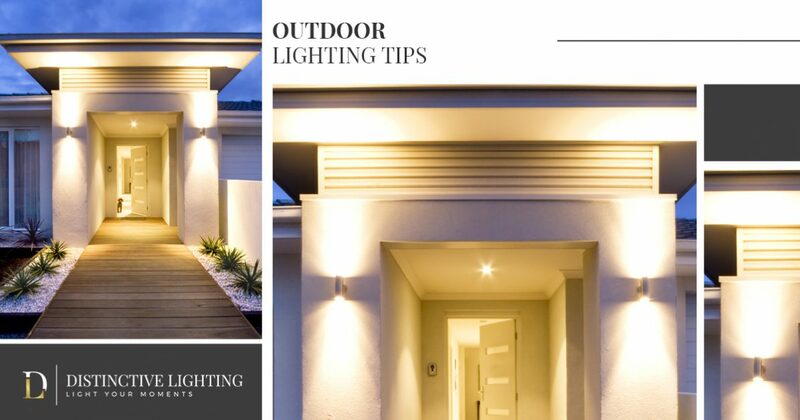 While many make the mistake of choosing their light fixtures before researching which options are right for them, today, we will be highlighting a few outdoor lighting tips that can help you create an inviting environment for both your family and friends. At Distinctive lighting, we are Bozeman’s top supplier of lighting products. As the best lighting company in the Gallatin Valley, our team of knowledgeable professionals are veterans in identifying your needs, suggesting which lighting products are right for you, and refining your selection so that you are left with a handful of lighting products that you will love. So whether you are looking for lamps, sconces, fans, or any other lighting items, Distinctive Lighting has you covered. To learn more about how your next outdoor lighting project can be completed as smoothly as possible, continue reading more on the subject below. When adding light fixtures to your home’s exterior, it is important to keep in mind that more lights tend to produce more light pollution. You may be asking yourself, “what is light pollution?” Light pollution is a term that was coined to address the growing concern for the excessive amount of artificial light that continues to flood streets and neighborhoods each night. While you want your outdoor lighting to make a statement, it is best to do so subtly instead of installing a handful of lights that will annoy neighbors or passersby. Not only does excess lighting cause an influx of harsh light, it also wastes energy, ultimately costing you much more in monthly utilities. There are a number of crucial areas surrounding your home’s exterior that should be well lit before moving on to other areas around your home. Below are just a few of the vital locations where you should consider placing your outdoor lighting before moving onto other areas of your home. Your driveway is where you start and end your day, and as such, it needs the right lighting for the early mornings and late nights. When you come home from work, you don’t want to stumble from your car to your front door, which is why installing lighting along your driveway can help to create a warm and welcoming environment while also serving practical function. This is especially important if you frequently host gatherings or large functions since many individuals’ first impression is made before even entering your home. Like many homes around the country, your home may have a number of steps leading to your porch, patio, or front door. These can be dangerous to navigate at night, and can sometimes even lead to injury if you were to experience a slip-and-fall accident. Similarly to driveway lighting, the lighting placed along your home’s steps can do much to create an inviting mood while also working as a pragmatic solution for illuminating areas around your home that may be cause for concern. After lighting the most important areas of your home, you can then begin to illuminate your home’s landscape. This is an incredibly exciting activity for homeowners, as it allows them to choose the specific characteristics of their landscape that they want to shine. For example, if your home features an eclectic outdoor fountain, you may want to consider an ample amount of spotlighting to bring your water feature to life. By making a list of prominent features around your home’s landscape, you can determine which are most deserving of receiving an ample amount of light. These are just a few simple tips that you can use to your advantage when it comes time to update your home’s exterior lighting. If you would like to learn more about the endless outdoor lighting options available, browse our vast online selection today! We know you may have questions or concerns regarding which lighting products are right for you, which is why our friendly team of professionals are always available to help. Contact us today at 406-586-7172, we look forward to speaking to you!